MilitaryOneClick attended U.S. Chamber Hiring our Heroes event at Washington Nationals Stadium, "2013 is The Year of The Military Spouse"
MilitaryOneClick attended the U.S. Chamber of Commerce Hiring Our Heroes event and Military Spouse Business Alliance Career Forum on December 5, 2012 hosted by the Washington Nationals Baseball Club in Washington, DC. "Capital One is proud to be an active participant and recently pledged $4.5 million to the Hiring Our Heroes Program," Mr. Ben Lamm, VP, Operations, Capital One. Mr. Thomas Donohue, President and CEO of the U.S. Chamber of Commerce, announced today, "2013 is The Year of the Military Spouse." Hundreds of employers, veterans, active duty military, military spouses, guests of honor and Senior Military Spouses gathered in a beautiful space overlooking the iconic baseball diamond at the Washington Nationals Stadium. Ms. Lara Potter, Vice President and Managing Director, Communications & Brand Development for the Washington Nationals, stated, "we are so fortunate to have the ability to play baseball in the Nation's Capital...the Washington Nationals show their support with special events for military families at the stadium and also by bringing the players to Walter Reed to visit with families of our wounded service members." Mr. Ben Lamm, Vice President, Operations, Capital One, also emphasized, "the military and their spouses are a natural fit for hiring... and Capital One is proud to be an active participant and recently pledged $4.5 million to the Hiring Our Heroes Program." Mr. Donohue, President of the Chamber of Commerce explained how successful the Hiring Our Heroes events have been so far, therefore they created the Military Spouse Business Alliance directed by Laura Dempsey and Noreen O'Neil. 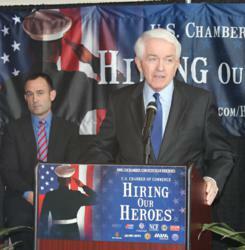 Mr. Donohue stated, "the goal is to have over 500,000 veterans and military spouses hired by 2014." Jennifer Pilcher, President of MilitaryOneClick spoke with Mrs. O'Neil, a military spouse herself, who agrees with Mr. Donohue, "the qualities military spouses have can't be taught and they are the exact qualities these companies want." Mrs. Pilcher also spoke with Mr. Ben Lamm, Vice President, Operations, Capital One more specifically about their hiring initiatives. Mr. Lamm, a veteran, stated, "Capital One has hired hundreds of veterans and military spouses because of their unique leadership skills, problem solving skills and professional experiences. Capital One also supports military spouses by transporting their job with Capital One when they move from one area to another. Our priority is to hire and keep the talent." Mr. Lamm also announced the "Work at Home" program through Capital One which, "allows flexibility using technology and creates a mobile environment. This is a great program for military spouses." Mininia Hawkins representing the Department of Defense Military Spouse Employment Partnership program expressed her excitement with the announcement that 2013 will be the Year of the Military Spouse. "Our MSEP companies are ready for the challenge...this announcement also increases the awareness for additional partners to join the Military Spouse Employment Program providing more employment opportunities for military spouses." Pilcher also spoke with Rekisha White who is a veteran, military spouse and currently working with the US Army Corps of Engineers. Ms. White said, "I have been to so many career fairs where they talk to me as a "vet" and not as a military spouse. I am so happy companies are now talking to me as a military spouse and looking at the untapped resources military spouses have to offer." During the event, Mrs. Pilcher had the opportunity to speak with SgtMaj Brent Jurgersen (Ret.) accompanied by his service dog, Houston, from Patriot PAWS. Jurgersen survived two separate life threatening events and injuries while on active duty service. The first during Operation Iraqi Freedom in 2004 and then the second, after he volunteered to go back to Iraq, in 2005. These injuries, which include a full leg amputation, did not stop Jurgersen who remained on active duty until his retirement in 2011. Although Jurgersen has an extraordinary story of survival, he prefers to blend in with his fellow veterans when meeting with potential employers. When Pilcher asked what specifically he was searching for at the career fair, he smiled and said, "I'm looking for a new opportunity to give back to a country who has given so much to my family and me." MilitaryOneClick.com is a dynamic global digital platform providing Opportunities, News and Entertainment. MilitaryOneClick is a military spouse owned company and a proud partner of the Military Spouse Employment Program (MSEP) through the Department of Defense.